What kind of cases is Speck making for the new Samsung Galaxy S5? We’re hard at work on three new cases for the Galaxy S5. Our award-winning CandyShell packs a bold look and military-grade protection in two layers, while our CandyShell Grip adds raised rubber ridges to the classic look for a better hold. Finally, our brand new CandyShell Inked features high-res graphics on a scratch-resistant coating for bold colors that won’t fade. Check them all out here. I love Speck’s cases for the new Samsung phone! Will they fit my Galaxy S4? Thanks! We’re constantly trying to upgrade our designs and out-do our last looks. Our cases give your new Galaxy S5 a perfectly snug fit, and since the S5 is thicker and has a larger screen than before, these cases won’t work with your Galaxy S4. To learn more about the differences between both devices, read our quick comparison. 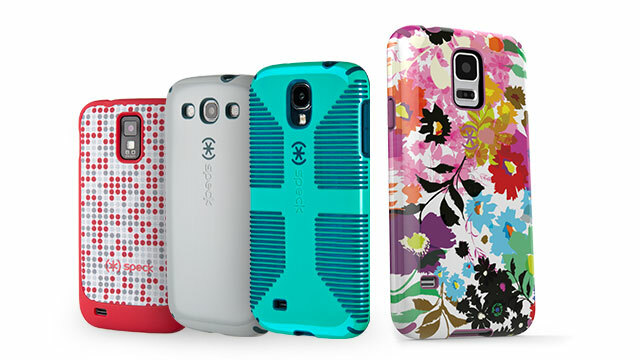 Are you going to come out with new CandyShell Inked designs for other Samsung products? Here at Speck, we’re forward-thinkers. We’ve been working hard at coming up with the most stylish and protective Samsung phone cases for all of the new devices. That said, we are always open to suggestions for both your new AND older models! If you absolutely need CandyShell Inked for your S4, let us know on Facebook, Twitter, or Instagram. I NEED to buy these cases! How will I know when they’re ready? Check out all of Speck’s Samsung Galaxy S5 cases and sign up for each product to hear first when they’re available.